Salvation And Survival: It's Time To Stop Apologizing! It's Time To Stop Apologizing! This morning my emotions are running the full gamut; they range from extreme sadness to righteous anger to mind-blowing frustration. 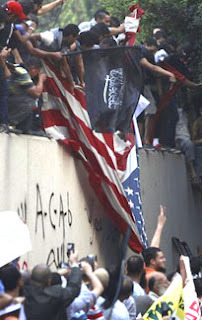 We all witnessed the defilement of our flag at the embassy in Cairo, Egypt, and the raising of the black banners of jihad. News sources are beginning to uncover the facts; that this protest was planned in advance to occur on the anniversary of September 11th, a date that is celebrated among radical Islamists. Then hours later, in Libya, America was attacked, and Americans murdered, by enemies that hate everything we stand for. While, the attacks did not happen here in the homeland, they nevertheless happened on what was supposed to be safe and protected ground. Diplomatic delegations, such as the one in Libya led by slain Ambassador J. Christopher Stevens, are guests of the host country and are supposed to receive special protection from that country's security forces. We are supposed to believe that the attack on his safe house and the deaths of four American diplomats was the result of a protest that got out of hand, rather than a complex, coordinated terror attack. Whether or not this proves to be true over the coming days, it is hard to believe that this tragedy is solely the result of some third-rate Youtube video that offended the religious sensibilities of faithful Muslims. For the time being, this is exactly the approach that the Muslim Brotherhood in Egypt is taking. This is the statement they released: "We strongly condemn the deadly attack on the US Embassy in Benghazi, Libya and the tragic loss of lives. We urge restraint as people peacefully protest and express anger." In other words, we are sorry people died, but it was simply the result of our justifiable anger. They are calling for further protests on Friday. Then, to add further insult to this heinous tragedy, the Deputy Interior Minister of Libya, in his official statement, appeared to be blaming the American consulate for not taking necessary security measures! But questions remain. 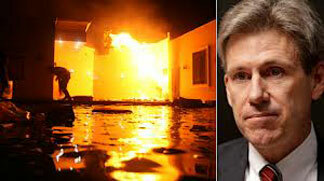 How did the mob know exactly where Ambassador Stevens was located? How did they know the exact rooms within the safe house compound he could be found? And this attack was far more sophisticated than the Cairo embassy protest; since when are RPGs present at citizen protests? Today we mourn the loss of American citizens; people who served this country and lost their lives for the simple reason that they are Americans. The hate that led to their deaths is hard for us to understand. We can't even contemplate the depth of such hostility and hatred. It is not in our nature. We can't grasp the mindset. And it makes us vulnerable and susceptible to attacks such as these. This is what prompts my incredible sorrow. The world no longer responds to diplomacy, discussion, or debate. We are quickly spiraling into a state of chaos and disorder, where it is "kill or be killed." And still our leaders apologize for who we are! I'm sure you all are aware of the statement released by our embassy in Cairo, Egypt. Whether they released this statement with or without the approval of the White House, this is what leads to my exasperation and anger. Where is the outrage from our Commander in Chief? When do we defend the interests of the United States and stop trying to be a champion of global conciliation? Stop apologizing! Until we acknowledge that we are hated and are targets of radical fundamentalists --- and until we start STANDING UP for who we are and the freedom we represent, and quit ignoring that our appeasement is viewed as weakness --- until then, these attacks will increase in number and ferocity. The fact that we continue to give millions of dollars in foreign aid to Libya (and $1.5 billion to Egypt!) adds to my exasperation. But I think it is the treatment of the leader of our strategic ally in the Middle East, Benjamin Netanyahu, that is the most vexing and frustrating. Can we be any more disrespectful? Iran is continuing with its deadly threats, and everyone knows the Middle East is a powder keg, with no one in the region on the side of Israel. Netanyahu asks for a meeting with his most powerful ally in the world, and he is refused! What message does that send to Israel's enemies? It's not hard to see that opponents of freedom would declare open season on Israel. The United States, Israel's strongest and historical ally refuses to support her. That would seem to give Iran the green light to proceed with their nuclear weapons development, wouldn't it? And it is irrefutable that we are viewed as weak and spineless in the Arab world. I cannot finish this post without pointing out what seems to me to be the fast approaching fulfillment of Ezekiel 38 and 39. All the players are being put into motion to come against Israel. Iran, Egypt, Libya, Turkey; they all would like to see Israel's sovereignty eliminated. The remaining player, Russia, is behind the scenes, manipulating the others and playing both ends against the middle. We may not see their influence until the flashpoint. Finally, I want to point you to my post of July 5th. Titled America and Israel: Destinies Intertwined, I pointed out the historical natural and political disasters that occurred whenever America took a stand against Israel's national interests. Within 48-72 hours of these instances, our nation suffered consequences. Could it have happened again? Could the attacks on the embassies in Egypt and Libya be the result of turning our back on Israel? I know that many will ridicule this opinion, but none can deny the facts. We insulted Israel and appear to be denying her our support. Hours later, our embassies are attacked and Americans are dead. This is all coming together according to Biblical prophecy. While tremendously disturbing, I know that my God is in control, and that gives me hope. These things must happen. I pray for endurance, courage and increased faith. I invite you to do the same. Matthew 24:12-13 "Because of the increase of wickedness, the love of most will grow cold, but the one who stands firm to the end will be saved. " Hi Belle - I'm not in full agreement that Russia is connected with the islamists in North Africa and the Middle East. During the "Arab Spring," (Yes Mr. Obama, you built THIS) both the Russians and Chinese were reluctant to join in support of the regime changes in Tunisia, Libya, Egypt and Yemen. Currently, the Russians actively oppose support of the Syrian "rebels." Russia has a severe islamist problem within its own borders. There are wastelands in Chechnya still where open warfare was waged by Russian Army forces against islamist separatists. Suicide bomb attacks have happened multiple times in Moscow. And China has its muslim separatists in the southwest along the Indian border. I'm no fan of either Russian or Chinese foreign policy, but I'm not ready to concede they are involved in the Magreb (what the Arabs call their western countries in North Africa -- literally, "magreb" means "sunset lands.") Al Qaeda has plenty of its own motivation, funding and weaponry. I can see Vladimir Putin laughing out loud in his office as he watches American influence dwindle where we once had allies, but I don't see his hand in Libya. With this said, and beyond the tragedy of American lives lost needlessly, I am most disappointed in the utter failure for the Mainstream Mouthpiece Media to note that all this Muslim "rage" is a barbaric excuse to wage violence. Just like the Danish newpaper cartoons, the trumped up Qur'an burning in Afghanistan, Salman Rushdie's "Satanic Verses" book, and other silliness, nobody is criticising Islam in general as being childish bullies whenever they choose to take insult. You CANNOT build a church in Saudi Arabia, Kuwait, Qatar, etc... And you may not openly worship in Pakistan, Afghanistan, Iran, or even in most places in Iraq. Christians are murdered for their faith every day in Muslim countries, Christian girls are kidnapped and forcibly converted to be "married" to their kidnappers in Pakistan, India and Egypt. But some stupid You Tube movie is now an excuse to murder a US Ambassador??!!?? Oh, and it's the MOVIE MAKER'S fault, not the rioters. This is just the first anti-American act in that region. There will be many more. And they will be here in the US, too -- remember MAJ Nidal Hassan? With a radical faith that openly declares "death in the cause of Allah" as its highest aspiration, an American popular society that is too pre-occupied with the cognitive dissonance of simulaneously blaming itself for all the world's ills yet declaring everybody a victim with no sense of responsiblity, and a mass-media 5th-Column of reporters that wants more to create chaos than research the causes of it, strong Christian and American values such as yours will be invaluable. You know how much I respect your opinion, and you certainly have much more knowledge of the region than I do .... I am just a relatively intelligent citizen who is trying to figure things out. Plus I believe that the Bible is Truth and this sure looks like it is lining up with the prophecies of Ezekiel. And I am looking at things through the very small lens of our earthly perspective. God's plan is SOOOO much bigger. So I would like to ask you to consider some possibilities and possibly answer a question for me ...... Have you heard any mention of Israeli/Russian negotiations over the Leviathan oil field? See http://www.americanthinker.com/2012/07/israels_oil_weapon.html. I don't have any real knowledge of this development, but could it possibly be a way to draw Russia into the scenario? And like I've said in the past, we humans just don't see the big picture. God is in control and I have a feeling we're in for some surprises! As always, I tremendously respect your opinion and perspective. I knew I would hear from you today and couldn't wait to get your thoughts! Thanks, my friend! I was aware of the discovery of the natural gas fields in the Mediterranean. I didn't know they had named it Leviathan. I also didn't know that GazProm was interested (read: Putin's personal money laundering/money making machine). Wow. My reaction to that story -- and I often take American Thinker with a grain of salt -- is tentative. This recent story, http://in.reuters.com/article/2012/09/09/leviathan-natgas-offer-idINL5E8K904520120909, shows a Texas company with substantial holdings in the development. But then again, "international" companies can mean a lot of different things. What a shift in politics your story implies: Russia has been mostly in opposition to Israel. Partly cultural because so many Russian jews fled the USSR to go there, partly because Russian has a history of supporting Arab regimes as part of their attempts at hegemony in that part of the world, and a lot because they like doing anything that throws sand in the gears of US foreign relations. Now they could be a major energy partner? What a change in the wind. My mind boggles at all the potentials to be considered. Of course, it also leaves me disheartened to a large degree because of our current Administration's blind ideology to oppose any fossil fuel increases. We'll blow this opportunity faster than Joe Biden can misspell "Jobs." The world is changing so fast that it's hard to know what to believe! And beware of the wolf in sheep's clothing, right? I used to feel confident and secure, thinking I knew that we could count on our Leaders to steer us through dangerous waters, but this one seems to want to take us over the falls! I appreciate your thoughts and we'll compare notes in the coming days, alright? thank you for speaking the truth. I enjoy reading your blog every day. Thanks for reading it! I appreciate you for taking the time to let me know your thoughts.